With “Judges Week” for E3 going on leaks and rumors are beginning to spill! 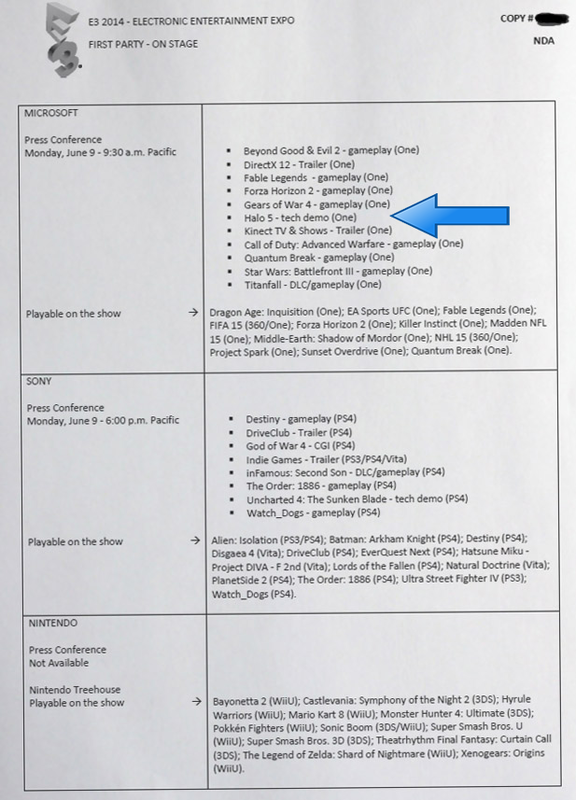 The following image has surfaced on social media which lists a Halo 5 tech demo and no mention of the repeatedly rumored Halo 2 Anniversary. Keep in mind this hasn’t been confirmed. For those who don’t know what Judges week is it’s when a elite group of individuals get earlier access to interviews and demos hosted by game publishers at E3 weeks ahead of the conference. This entry was posted in Halo 5: Guardians, Xbox One Articles and tagged E3, E3 2014, E3 Leak, Halo 2 Anniversary, Halo 5, Xbox, Xbox One by Chief Canuck. Bookmark the permalink.